LENIN called Trotsky Judas-and cautioned the people repeatedly to beware of him. Today Trotsky and his agents stand exposed before the whole world. They stand exposed and branded as the worst Judases the world has ever known.Worse than our own Benedict Arnold who betrayed his country­men at a time of great stress and crisis. Naturally there are some who are still in doubt. And, natur­ally again, Trotskyite agents seek to exploit these doubts to confuse some people and, under cover of confusion, to pro­mote Trotsky's horrible conspiracies. It is incredible, some people say, that Trotsky and his agents should have gone so far. Conspiring with Hitler and Japan to dismember the Soviet Union, to destroy its socialist system, to restore capitalism, to carry on espionage for the fascist powers, to engage in wrecking activities which cost the lives of many workers, to plan assassination of Soviet leaders, actually to help the fascist aggressors, especially Hitler Germany and military-Fascist Japan, to begin the world war for which these powers are openly and brazenly preparing. Incredible, say the doubters. Yet most of these same people cannot help but agree that it is true none the less. Trotsky and his agents have been actually proven guilty of all these unspeakable crimes. Proven guilty in· open court, the highest court of the Soviet Union, in the presence of . numerous foreign diplomats and correspondents. The thing is not incredible at all for those who are familiar with the development of Trotsky and Trotskyism. And it will c.ease to appear incredible to all sincere persons once they learn something of these developments. We shall come to these later on. For the moment suffice it to say that just as the American revolution had its Benedict Arnold and Aaron Burr, and just as our period of the Civil War had John Wilkes Booth, the assassin of Lincoln, so the Soviet Union is having its Trotsky, Zinoviev, Piatakov and the others. The Soviet Union has all these traitors as we had ours, but with a difference. And the difference is this: The socialist revolution, which gave birth to the Soviet Union, goes much deeper than our revolution did. It builds for the establishment of a classless society. Hence it affects the interests of both friend and enemy much more vitally. Hence its defeated enemies carry on their resistance longer and resort to more horrible means. Hence its traitors are more horrible and detestable and the consequences of their treason reach out far beyond the confines of the Soviet Union. 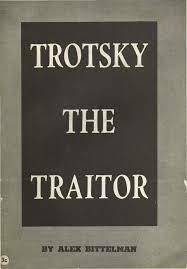 The actions of the Trotsky traitors are therefore a menace to all of us, to all progressive mankind. Read the proceedings of the January trial: the confessions of the accused, the testimony of witnesses, the letters of Trotsky, other documents, the examination of accused and witnesses, and the summary speech by the pr_osecutor. The truth is there. And it is this truth that exposes and condemns the Trotskyites as agents and partners of fascism, as enemies of the people. The conspiratorial machine shapes up like this: Piatakov, Serebriakov, Radek and Sokolnikov functioned as a secret leading committee known as the Trotskyite "Parallel Center". This committee worked side by side with the "United Trotsky ­Zinoviev" terrorist center, tried and condemned in August, 1936. Under this "Parallel Center" of Piatakov and Co. worked a:n,other group of old-time and well-known Trotskyites: Mura­lov, Boguslavsky, Drobnis and Livshitz. And with them operated a group of spies and agents of the fascist intelligence services: Rataichak, Stroilov, Grasche. When asked by the prosecutor: "Were the members of your organization connected with foreign intelligence services?" Piatakov answered: "Yes, they were. It is necessary to return to the line of Trotsky in order to make it clearer." In the course of the examination, that line became very clear. It called for acts of wreckage and terrorism. It called for treason to ·the Soviet Union and to socialism. I must state that the instructions with regard to wrecking met with rather serious resistance among the followers of Trotsky, arousing perplexity and dissatisfaction. We informed Trotsky of the existence of such sentiments. But Trotsky replied that the instructions regarding wrecking were an essential and integral part of his policy and were his line." In December, 1935, Piatakov met Trotsky near Oslo, Nor­way. Trotsky was agitated and greatly dissatisfied with the slow manner in which his agents were operating, especially in the matter of wrecking. He reproached Piatakov in these words: "You canot tear yourselves away from the Stalinist navel cord; you take the Stalinist construction for socialist construction." Bitterly and sarcastically Trotsky hammered at Piatakov: "Socialism cannot he built in one country"; "the collapse of the Stalinist ;tate is absolutely inevitable." And Trotsky had his way. The "Parallel Center" proceeded to organize acts of wrecking and assassination. Drobnis, Mura­lov, Boguslavsky and Livshitz went forth as the "field organizers" to do the job: in the Kuzbas, the Kemerovo mines, in the Ukraine, on the railroads, in the chemical industry. By order of Piatakov, Drobnis was shifted from Central Asia to Western Siberia to concentrate on wrecking, especially to in­jure the defense capacities of the country. Not by accident did the Trotskyite plotters pay so much attention to Western Siberia. As is seen from their collaboration with the agents of the Japanese intelligence service, the Trotskyites were plan­fully aiding the war preparations of the Japanese military­£ ascist clique. Boguslavsky too was operating in Western Siberia, being a member of the Novosibirsk Trotskyite center. Muralov in­spired and directed Boguslavsky, who was engaged in spoiling locomotives and sabotaging important rail way construction. From Muralov, Boguslavsky knew that Trotskyite groups were operating in the Kuzbas to organize the assassina­tion of visiting representatives of the national government, and that such attempts were actually organized against V. M. Molotov, chairman of the Council of People's Commissars, and L. M. Kaganovich, People's Commissar of Railways. Another carrier of the "Trotsky line" was Livshitz, an old Trotskyite and formerly Vice-Commissar of Railroads. He had been doing his best to wreck the rail way system. And in addi­tion--espionage work for the Japanese intelligence service. He turned over information of great military value to the Japanese agents through Kniazev, another of the accused on trial. And Kniazov was the active link between the Trotskyites and the Japanese intelligence service. Kniazev confirmed that for a similar job the Japanese turned over to Turck, another accused, 35,000 rubles. "Not I alone am accusing. Alongside me, comrades and judges, I feel that here stand the victims of these crimes and of these criminals-on crutches, crippled, half-alive and possibly utterly disabled-like the woman switchman Comrade Nagovitsina at the Shustovo station .• who lost both legs at the age of twenty in preventing the collision organized by these very people." "I had three letters from Trotsky: April, 1934; De­cember􀆥 1935; and January, 1936. In the 1934 letter, Trotsky raised the question in this way." "The advent of fascism to power in· Germany basically changed the whole situation. It means the near prospect of war. War is inevitable, all the more so because the situation in the Far East is becoming strained. Trotsky did not doubt that this war would cause the defeat of the Soviet Union. He wrote that this defeat would create real conditions for the bloc to come to power, and he drew the conclusion from this that the bloc was interested in sharpening the conftict"
Thus we have it from the mouth of Radek, and on the basis of a letter by Trotsky, that this counter-revolutionary gang, calling itself "a bloc", was not only speculating on the defeat of the Soviet Union and the victory of fascism, but was consciously working towards these ends. "The bloc", wrote Trotsky, "was interested in sharpening the conflict." Let the meaning of this be fully understood: Trotsky said he was interested in hastening the coming of war and he was further interested in the defeat of the Soviet Union result­ing from this war. "Trotsky mentioned in the letter that he had established contacts with a certain Far Eastern country and a certain middle European country and had openly told semi-official circles of these countries that the bloc ·took the line of bargaining with them and was pre­pared to agree to considerable concessions, both economic and territorial." "Firstly, German fascists promise the Trotsky-Zinoviev bloc a favorable attitude and their support if the bloc achieves power, both during the war and before the war." "But the fascists receive the following compensation for this. A generally favorable attitude by the bloc to German interests and the German government in all question of international policy. "Certain territorial concessions. This was called 'non-resistance to Ukrainian national bourgeois forces in the case of their attempt at self determination'. This means, in concealed form, what Radek spoke of here when he said 'If the Germans set up their Ukrainian government, which, of course, they would not control through a German governor-general but perhaps through a Helman, but in any case Germans would self-determine the Ukraine' and the Trotsky-Zinoviev bloc would in any case not oppose this. In essence this meant the dismemberment of the U .S.S.R. "The next point in the agreement dealt with the form in which German capital would get a chance to exploit the resources and raw materials of the U.S.S.R. It required especially gold mines, oil, manganese, lumber, apatite, etc. "The last point was: in case of military attack, it would be necessary to coordinate the disruptive forces of the Trotskyite organ­ization acting within the country with external forces acting under the leadership of German fascism." For these unspeakable treacheries against the progressive forces of the world, Trotsky had "justifying'' arguments. Of course. And the argument that must have been most con­vincing to Piatakov & Co. was probably this. "If we intended to come to power at all, then the real forces in the international situation were primarily the fascists and we must establish contact with these forces, one way or another. "Trotsky immediately pointed out that this favorable attitude would not be the result of any special love on the part of these governments for the Trotsky-Zinoviev bloc. It would proceed simply from the practical interests of the fascist governments and from what we promise to do for them if we received power." Thus Piatakov related his interview with Trotsky near Oslo. Sure, there is little love lost between Hitler and· Trotsky. We did not need Goering to tell us that Hitler does not love Trot­sky. It was, as Trotsky explained to Piatakov, a "practical" proposition of give and take. Trotsky did not overlook Japan either. In his second letter lo Radek, December, 1935, Trotsky outlined the nature of the "concessions" that the Trotsky-Zinoviev bloc would make to Japan. These included: the ceding to Japan of the Soviet Maritime provinces, the Amur region, and a guarantee sup­ply of Soviet oil to Japan in case of a Japanese-American war. 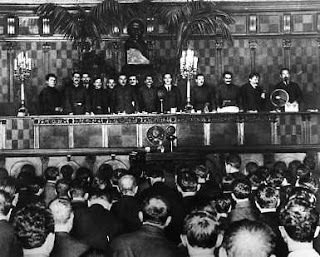 Upon instructions from Trotsky, Radek and Sokolnikov conferred in Moscow with diplomatic representatives of Germany and Japan, confirming Trotsky's "promises" to these powers and assuming responsibility for them. Thus unfolded itself at the trial the Trotsky program, and the criminal Trotskyite deeds, in their plot to become the rulers, to secure power, in the Land of Soviets. Why did they want power? What kind of power and what sort of government were they looking for? And what sort of economic system would they establish? "Trotsky considered that the result of defeat would be inevitable territorial concessions, and he definitely mentioned the Ukraine. Secondly, the question was raised of partitioning the U.S.S.R.
Thirdly, from the economic viewpoint, he envisaged the following results of defeat: not only giving out as concessions the industrial plants important for the imperialist states, but also handing over, selling to capitalist elements, as private property important economic objects which they would indicate. Trotsky foresaw the floating of joint stock concerns, namely, admitting foreign capital into operation of factories which formerly were in the hands of the Soviet State. "In the sphere of agrarian policy, Trotsky clearly raised the question that· it was necessary to dissolve the collective farms and advanced the idea of providing tractors and other complicated machinery to individual farmers and of restoring a new kulak strata. Thus in a letter of Trotsky to Radek in December, 1935, Trotsky sought power to restore capitalism. Incredible? Not at all. We shall show later how this was the inevitable result of the entire course of the development of Trotskyism. But, even without that, every unprejudiced person should be able to see that, in plotting the overthrow of the Soviet government, Trotsky couldn't seek anything else but the restoration of capitalism. Consider: in his own writings and speeches he slanderously maintains that the system built in the Soviet Union is not socialism. He further maintains, openly and. publicly, that socialism in the Soviet Union alone is impossible. This is a fundamental tenet of Trotskyism. This being the case, it takes little reasoning to understand that Trotsky's plotting for power in the Soviet Union could not be for the purposes of building or maintaining socialism. And if it is not socialism, because this is excluded by Trotsky's theory itself, what can it be? The restoration of capitalism. This and nothing else. And this was exactly what the January trial disclosed and proved. Trotsky does not call it by that name. Radek, for example, speaks· of it as the "inevitable leveling of the socialist system of the U.S.S.R. with that of the victorious fascist countries". But the meaning of it is plain: the restoration of capitalism. "'There cannot be any question about any democracy. The working class. has lived through eighteen years of the revolution, and has a tremendous appetite, but it is necessary to bring the workers back, in part, to private factories, partly to government factories, which will probably he in condition of severest competition with private capital. This means that a sharp worsening of the conditions of the working class will take place. In the villages, the struggle of the poor and middle peasants will begin again. And then to hold power, a strong government will be needed, independently of what forms it will have.' "
"If you want historical analogies, said Trotsky, take that of Napoleon I. Napoleon's government was not restoration; the restora­tion came latter. But this government was an attempt to preserve tho chief gains of the revolution, to preserve everything possible from the revolution." Incredible? Hard to believe that Trotsky would think of himself as another Napoleon, plotting with fascism "to pre­serve everything possible from the revolution"? Not at all. Ten years, or so, ago, Trotsky declared that he was preparing himself for the role of Clemenceau (war premier of France), to save the Soviet Union when the enemy was at the gates of Moscow. And for this he had to overthrow the "Stalin govern· ment'' which, according to himself, was leading the country to defeat. The present Napoleon scheme of Trotsky is a development and variation of the old Clemenceau scheme.